Karur Vysya Bank Jobs Recruitment Notification 2018.Karur Vysya Bank inviting applications for the positions of executive and officer posts namely assistant general manager, senior manager, assistant managers.Interested and Eligible candidates can apply for the positions. Total number of posts to be filled in Karur Vysya Bank is various. Post names are given below. For Assistant manager post the qualification is post graduation from a recognized university and should have 2 years of experience. For remaining posts the qualification is degree preferably with JAIIB/ CAIIB with years experience. Maximum age for assistant general manager is 50 years, chief manager is 45 years, senior manager is 40 years, manager is 35 years and for assistant manager is 28 years. Candidates will get pay as per bank department norms. Through interview session candidates will be selected. 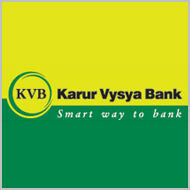 Mode of applying for Karur Vysya Bank recruitment is through online mode from 14th August 2018 to 31st August 2018.
https://www.kvblimited.com/psp/kvbcg/?cmd=login&errorPg=ckreq&languageCd=ENG is the link for applicants to register.